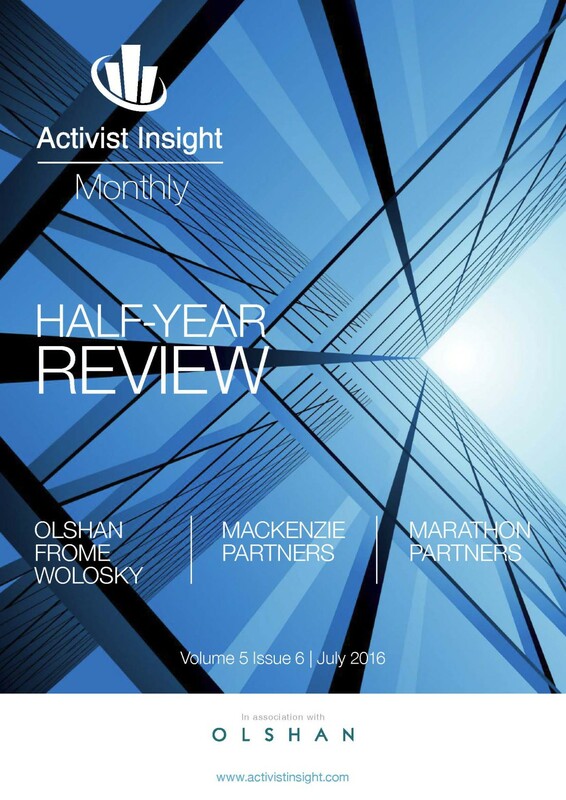 Activist Insight, publisher of Activist Insight Monthly, announced that it has issued its Half-Year Review 2016, in association with Olshan’s Activist & Equity Investment Practice. The review highlights major trends in shareholder activism, reveals statistics on activist campaigns during the 2016 proxy season and features interviews with key players in the shareholder activism space. Steve Wolosky and Andrew Freedman contributed expert analyses to the review in both a foreword and interview with Activist Insight’s Josh Black. In the interview discussed were major areas of growth in shareholder activism, the latest tactics used and recent proxy battles. To date in 2016, Olshan has already advised on over 60 activist campaigns, delivered 54 nomination letters, negotiated 42 settlements, and has helped clients seat over 79 new directors at public companies. To read the Half-Year Review, please click here.